Can a city in the heart of Silicon Valley make a solar feed-in tariff program work? What do Germany, Italy, Gainesville, Florida, Sacramento, California and Palo Alto, California have in common? Well, as of March 5, all of those places will have solar feed-in tariffs (FIT). That's if Palo Alto's City Council passes the feed-in tariff pilot program it has developed over the last few quarters. It's a pilot program for the City of Palo Alto Utilities (CPAU) -- the first year is capped at 4 megawatts and meant for medium-sized commercial rooftops with a minimum size of 50 kilowatts per installation. The FIT is applicable to solar only, although other renewable energy sources could be considered later on. The city will pay $0.14 per kilowatt-hour for 20-year contracts. Palo Alto is arguably the heart of Silicon Valley, home to dozens of venture capital firms and thousands of new companies armed with a startup and innovation culture fueled by its immediate neighbor, Stanford University. The city itself has about 26,000 electric meters and a peak load of approximately 180 megawatts. The program limits itself to medium and large commercial solar rooftops in the interest of keeping workload issues to a minimum in the early stages of this endeavor. $0.019 avoided transmission access charges (TAC), an amount paid in California for every kilowatt-hour that is delivered from the transmission grid. Craig Lewis, the Director of the Clean Coalition, a distributed generation advocacy group, attended the February 7 Palo Alto City Council meeting and commented that he saw this as "a good program, because it is constrained and not open to residential rooftops." He added, "It delivers the trifecta of being cost-effective, timely, and environmentally sustainable, and the pilot program is designed for success by avoiding pitfalls like dealing with tax complications of residential-level projects." Jon Abendschein, Palo Alto's Resource Planner, believes that $0.14 per kilowatt-hour is a price that will attract developers to the program. Detractors of feed-in tariffs have claimed that the prices can never be set at a proper rate and that auction mechanisms are a more equitable solution. Others have argued that having no subsidy at all is the right solution. 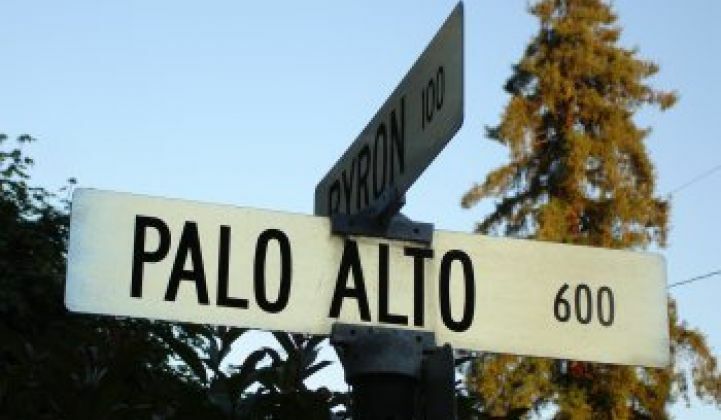 In the meantime, Palo Alto will likely have a FIT in place come March 5.